Your or your clients billing preferences are always met with simple adjustments in our invoicing and billing app. Our software offers features that will solve your accounting and billing problems. Choose a billable method and budget size for each project. Manage your project billing the way you or your clients want and stay within the limits of estimated expenses with our billing software. Get paid in two simple steps: track time and generate personalized invoices based on the tracked data. Time tracking and accounting in one place. Specify the hourly rate of team members or tasks and use the desired billable method for projects based on this feature. Be flexible when it comes to billing. Choose a task and project the time log applies to and add possible additional expenses. Divide your work hours with multiple time logs and bill them in a way that fits your needs. Edit your account settings and use My Hours in different countries without any problems. Don’t let geography and currencies get in the way of running a successful business. Generate and export insightful and visually pleasing reports. 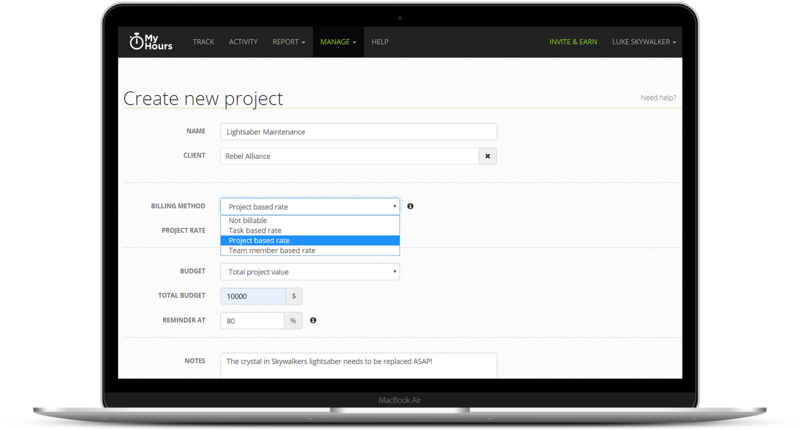 Track projects and learn from smartly organized data when it matters most. Simple time tracking features that allow you to track on unlimited projects and tasks. Real-time tracking or add manual time logs. Know exactly how you spent your work hours at the end of the day. Track employee attendance and absence. © 2019 MyHours. All rights reserved.